Bongo are among Africa’s most prized trophies. Today, Bongo hunting in Africa takes place in the rain forests of the Central African Republic, Cameroon, and Congo. They prefer the dense rain forests and are extremely shy, cautious animals. Originally Bongo were also common in the mountains of East Africa. Actor William Holden imported them from his ranch on Mount Kenya. . Our population of Bongo number over a 50 making it the largest herd outside of Africa. We release approximately 6 bulls each year from our breeding areas. These bulls are extremely shy and prefer to move and feed at night. Bulls will weigh 750 pounds or more. Bongo will stay in the thickest brush during the day and use the cover of night to protect themselves when they come out to feed. Trophy bulls are over 30”. Our breeder bull is over 36” which at only 4 years old, would make him #2 in the record books. 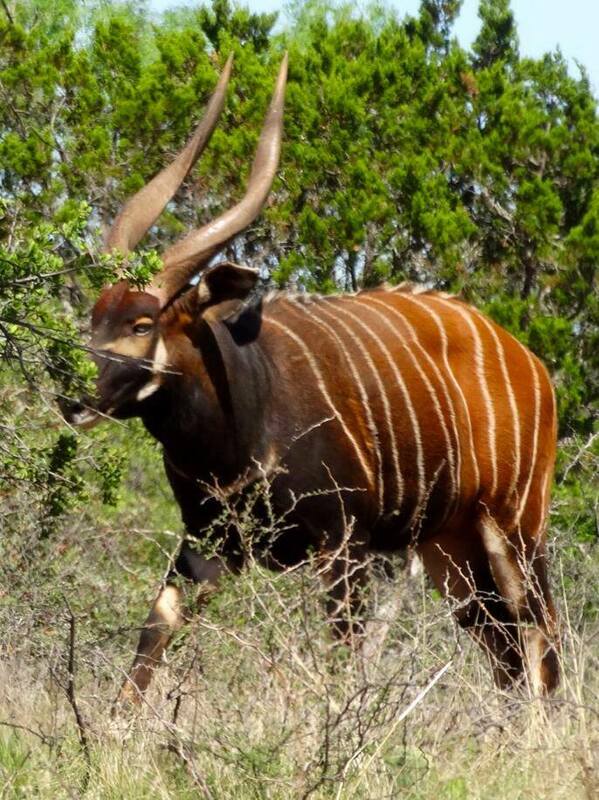 Hunting Bongo at the Star S Ranch is the same as hunting Bongo in Africa. Most of our guides are not only experienced hunting locally, but have international hunting experience as well. Because they are so nocturnal, hunters typically we will sit in blinds at night and wait for them to come to water or feed. Occasionally you will catch them moving just before dark. Because of the size of the ranch, trying to stalk them during daylight hours is pretty fruitless. We limit our hunting, only taking a few mature bulls per year. We are not going to hunt a bull until he has reached his maximum size. Because of our management and breeding success, Star S Ranch offers many larger bulls than you will likely see in Africa at a price much less than you would pay there. You will be staying in our new 7,000 foot Hunter’s Lodge which was complete the summer of 2014. The main lodge includes 32 foot ceilings with black walnut walls covered with trophies from around the world. A granite bar top and service area is perfect for relaxing and telling hunting stories. The back porch overlooks a lake where it is not uncommon to see Sable Antelope, Kudu, Axis Deer, and Whitetail Deer drinking water. There are 4 casitas with 2 queen sized beds and a private living room. One room and the lodge and surroundings are wheel chair accessible so all can enjoy the facilities and outdoors. Additionally, you can fly your plane into our 5,000 foot paved Star S Airport which is located in the middle of the ranch. At Star S Ranch, you will find all the amenities needed for a Corporate Retreat built around the wildlife and hunting loved by the avid hunter. 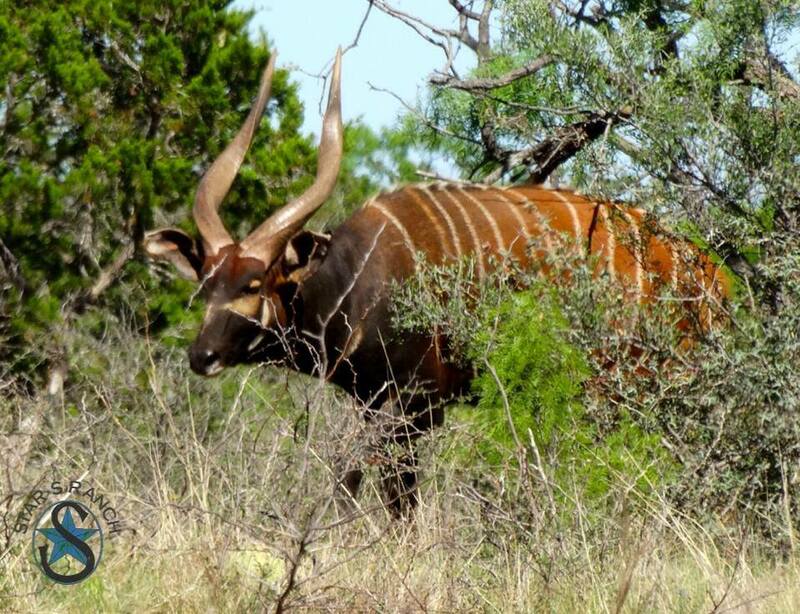 If you are looking for a true Trophy Kudu hunting experience with world record quality kudu, privacy, tremendous facilities, an experienced friendly staff, and among the simplest, fairest pricing in the industry, the 14,000 acre Star S Ranch should be on your short list. For other hunting opportunities, also look at Texas Whitetail Hunts, Texas Exotic Hunts, and Texas African Game Hunts. Book your hunt today by calling us at (830) 285-8753 or sending us an email.